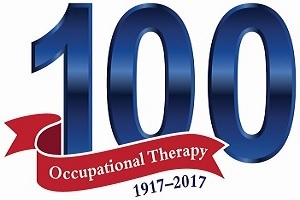 April is National Occupational Therapy Month, but this year the profession is also marking its 100th anniversary. The American Occupational Therapy Association conference and centennial celebration was held in Philadelphia March 30-April 2. Karin Barnes, Ph.D., OTR Associate Professor was named a fellow by the AOTA during the conference’s awards ceremony. Three faculty members presented at the conference. Bridgett Piernik-Yoder, Ph.D., OTR Associate Professor and Interim Department Chair, and Autumn Clegg, OTR, CBIS Clinical Assistant Professor presented on developing community partnerships to provide home evaluations for seniors in the community, and Assistant Professor Ana Allegretti presented on the pediatric mobility project, Go Baby Go! The department will celebrate the month with a cook out on April 21. “The faculty will be cooking for the first- and second-year classes to celebrate Occupational Therapy month and (Barnes’) award,” Piernik-Yoder said. Piernik-Yoder noted that research has shown that the pioneers of occupational therapy had it right when they focused on helping veterans of World War I and II recover by focusing their efforts on meaningful and useful everyday activities and occupations. “Now we have the evidence to show why addressing daily occupations makes a difference for people, not only in their functioning but also in their recovery after injury and illness,” she said.